Meritor and Eaton Authorized Rebuilders - Truck Gears Inc. Servicing Your Heavy-Duty Drivetrain Needs. Whether your heavy-duty rig is a Peterbilt, Freightliner, Terex or Caterpillar, Truck Gears Inc. is the one shop that you can trust for all of your heavy-duty drivetrain needs. Operating as both a Meritor Authorized Rebuilder and an Eaton Authorized Rebuilder, we have serviced both owner/operators as well as entire fleets for over 30 years. TGI has a longstanding reputation for providing the highest level of parts and service to the trucking industry. With our experienced, trained mechanics, and our friendly, responsive, personalized attention, you can rest assured that when TGI is on the job, you know that it will be a job done right. Free Pickup & Delivery Across Southern California. We pickup and deliver from San Diego to Bakersfield and Los Angeles to the Desert. Saturday and emergency service is available upon request. 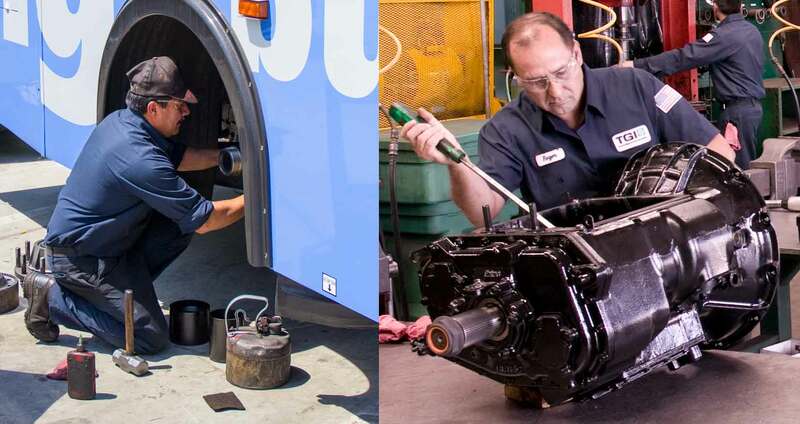 Truck Gears Incorporated is a “one-stop shop” for heavy-duty truck repair services. We specialize in developing and implementing repair and maintenance services for a wide range of clients across Southern California. Our qualified team of master mechanics, sales and service technicians enable us to perform the highest level of service available while keeping pricing competitive. Unlike many of our competitors, TGI offers an iron-clad promise on the quality work that we do. That’s why all of our class 8 remanufactured units are guaranteed with an optional two year, unlimited mileage, nationwide warranty. This warranty covers 100% of the parts and labor for the first 12 months, and parts only for the remaining 12 months. © 2018 Truck Gears Incorporated. All Rights Reserved.